I took this photo on my way back from selecting my dessert. Suddenly, a waitstaff said to me, “Sorry, you can’t take photos .” I apologized and went back to my seat. She came back and explained, “You have to be in the photo, you can’t just take a photo.” I thought this was sort of a strange rule, but since I was there on my own, there wasn’t anyone to take a photo of, so I had to do things the old fashioned way; by taking notes! I wasn’t sure if the no photo rule applied to the items that I ordered, so I only got a wobbly photo of my lemon tart, and sort of hoped all the tea ware was in the frame. The lemon tart was delicious. I’ve never made a lemon tart before, which is surprising, because I love lemon flavored desserts, so I’m not sure if I’m describing it properly; but the lemon tart at TWG had two layers, a top layer of perfectly tangy lemon curd, and a creamy and lightly sweetened custard filling, all encased in a dense buttery crust. At first glance, I thought the little white tag was made out of paper, but I was happy to discover that it was actually a dense disk of sweet white chocolate, which offset the tanginess of the lemon quite well. I ordered the Grand Wedding Tea, and to be honest, I selected it because it was a name that jumped out repeatedly when I paged through the menu. Luckily for me, the tea was lovely and fragrant, with a hint of tropical fruit flavor. I also liked the weight of the silver spoon in my hand~ also according to TWG’s website, it’s a silver plated scoop, and actually is a measurement for how many tea leaves you need for a cup of tea. Since I always just “guesstimate,” this may be something that I want to buy in the future. 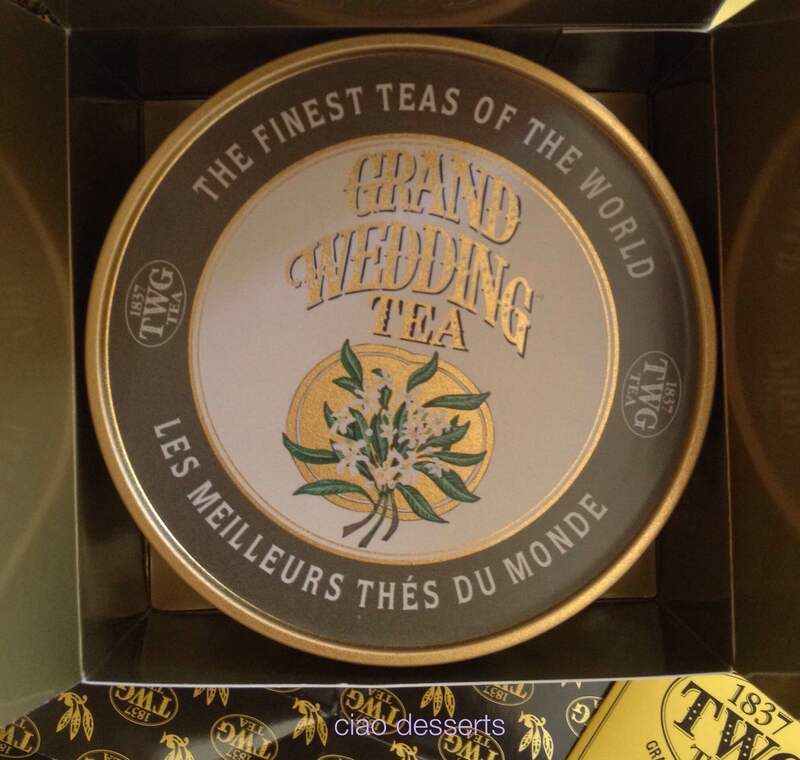 I enjoyed the Grand Wedding tea so much that I decided to purchase it so I could have it at home. The tea is black tea, infused with fruit flavors and sunflower petals. In a fit of efficiency, I had the tea gift wrapped too, so I could see the packaging and assess suitability for gift giving purposes. 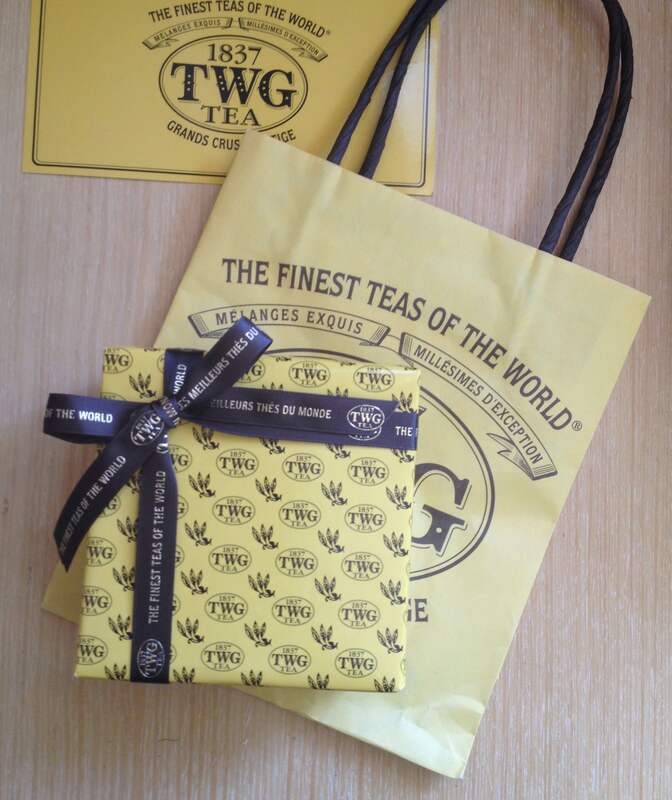 TWG hit all the right marks with their packaging; there is a signature double sided paper, and a brown and gold embossed ribbon. Instead of using just plain old tape, they also have TWG label stickers, which I thought was a nice clean look for the package. Also note the crisp and precise corners on the side of the package~perfection! The tea tin also comes boxed, with some lovely details. The most helpful touch was that they also included simple brewing instructions on the flap of the box. The tin is round and quite sturdy; I imagine I’ll probably use it to corral all my paperclips and a few rolls of washi tape once I’ve finished the tea. I think TWG would make an ideal housewarming gift, or a gift for your boss. Make sure to stop in for a pot of tea first before making your decision! 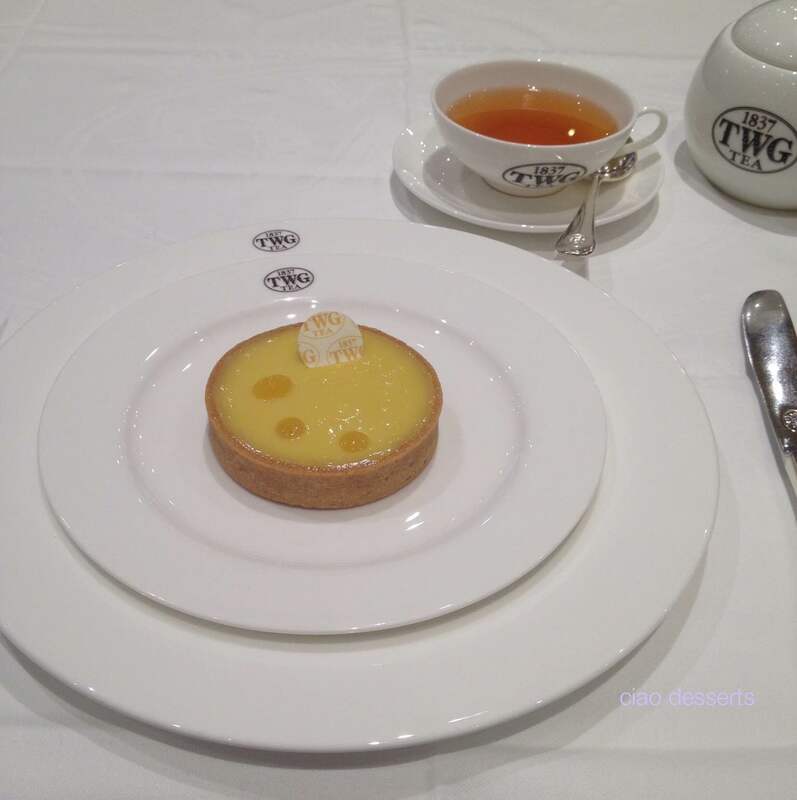 Overall, TWG is a exquisite place for afternoon tea, the atmosphere is tranquil, and the service is attentive. I think the waitstaff at TWG needs to be more informed about their teas (with more vivid descriptions, instead of “it’s black tea flavored with tropical fruit,” which is how they described three of their teas before I gave up and chose one for myself) but otherwise, it’s a perfect place to spend a summer afternoon. (You can read my other reviews of tea speciality stores in Taipei here, and here). 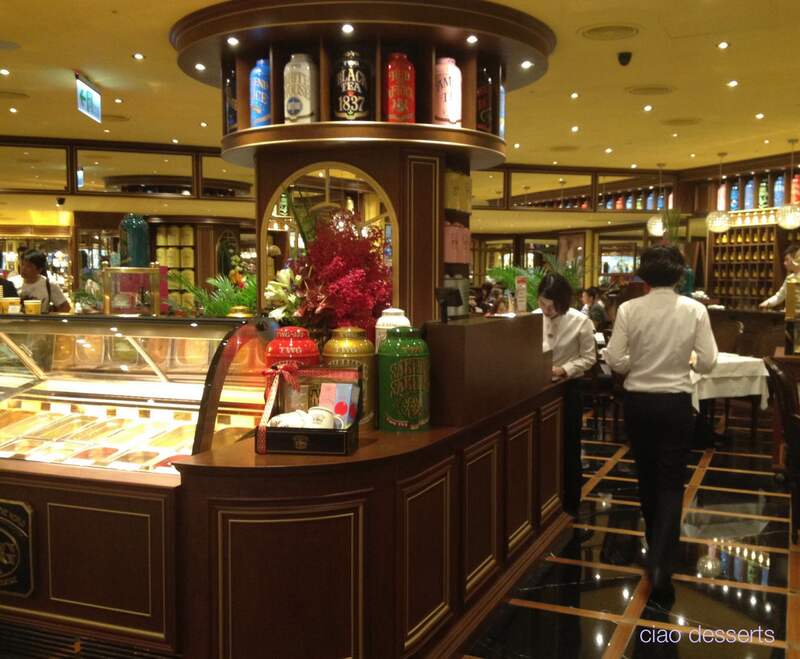 TWG also has additional locations at the Taipei 101 Building, and the Sogo Department Store. This was not a sponsored post, the experience and viewpoints expressed are my own. I paid for all items consumed with my own money. This entry was posted in Uncategorized and tagged afternoon tea, coffee cups, lemon, lemon curd, lemon tart, Singapore, sugar bowl, tea, tea sugar, teacup, TWG, TWG TEA, white chocolate. Bookmark the permalink.